My family are new hermit crab owners. So far, I have been reading aloud from Christa Wilkin’s website on how to care for the new pets to the family. They are too young for websites. Is there a book you could recommend? That’s a good question. Most of the books I’ve read are pretty outdated. Yeah, that ends up being the problem. Most of the care books just recycle the same old information from the 70's and 80's. Even things published this century became obsolete after 10 years. I think sometimes it's worth it for the history, but anything in a book should be double checked with a care group to make sure it is (or was) accurate and that it's still the current recommendation. I know that Hermit Crabs for Dummies had used information from the HCA, but I think it was published in tne early 00's. I’m not sure about a book, maybe someone who has been here longer than me can recommend something, this website will have the best info for you. If you browse the crabitat conditions, food, water, shells, and molting sections, I think there are stickies with the important stuff. It can feel like a lot to take in but once you get the basics, it does get easier. For me, I read what I thought I needed on proper food, tank conditions, and shells and just kinda went from there, asking questions along the way. I have young children also, it can be hard to explain things about hermit crabs to the young ones. They are very fun to watch but can be very boring when everyone molts. Getting a wyze cam or something similar is a good way to be able to watch them without disturbing them and actually see what goes on at night. 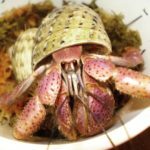 I wish I was creative, I would create something to help parents teach their kids about hermit crabs and make it somewhat fun when they’re too young to scour webpages for info. Last edited by RiNiKy506 on Fri Feb 01, 2019 6:02 pm, edited 2 times in total. You could always print out the careguides - or supervised internet time. I have a copy of hermit crabs for dummies, and really enjoy the read. I think its probably one of the best books out there for hermit crab keeping that the information isn't terribly outdated. It's a good read IMO. Thank you, everyone for your thoughts on the book question. One thing I learned is don’t bother buying any of the books for kids. I’ll work out a web based solution.